Omar al-Masharawi, son of a BBC cameraman in Gaza, murdered by Zionist bombs. Israel has launched yet another attack against the Gaza Strip, striking the densely-populated and besieged territory from the air and the sea, and as usual the United States, Canada and Britain have lined up in support of Zionist terrorism. Two things must be said. First, this round of escalation, like the 2008/2009 slaughter, was started by Israel. It is totally mendacious to pretend otherwise. The Hamas government in Gaza refrained from stopping other groups from firing missiles as a result of Israel’s murder of a disabled man and of a twelve-year-old boy in Gaza. Here is a timeline of events. Second, the settlers of southern Israel do not have the right to live without fear of attack while the original inhabitants of ‘southern Israel’ are herded into refugee camps. Eighty percent of people in Gaza are descendants of refugees ethnically cleansed from their villages and towns by Zionist militias in 1947 and 1948. No Western approach to the Middle East will be coherent or helpful so long as the West remains attached to apartheid Israel. America has granted some millions of dollars to support Syrian refugees and to provide a few revolutionary activists with satellite phones, but Obama refuses to recognise the Syrian National Coalition as representative of the Syrian people, and has made it clear that the US won’t be supplying weaponry to the Free Syrian Army. Indeed, the Obama administration has been preventing Qatar and Saudi Arabia from providing effective weaponry to the resistance. Fear of Islamism translates here into fear of anti-Zionism. No weapons can be supplied which might one day be turned against the occupiers of the Golan Heights and the tormentors of the Palestinians. Oil and geostrategy also ensure that Western policy on the Middle East will continue to lack credibility. After visiting Syrian refugee camps in Jordan David Cameron seemed to incline to arming the Syrian resistance, but he arrived in Jordan after a tour of the Gulf in which he’d offered to arm several tyrannies, including the Bahraini tyranny which is killing, imprisoning and torturing its democratic opposition. Bahrain hosts the US Fifth Fleet. This is absolutely correct. The slaughter of the people of bilad ash-Sham is as much of an abomination in Syria as it is in Palestine. American support for the frenzied Zionist bombing of Gaza is no more or less disgusting than Russian (and Iranian) support for Asadist barbarism. Furthermore, both Palestinians and Syrians have the right to self-defence. This is why I support providing anti-aircraft weaponry to both the Syrian and the Palestinian resistance. Many analysts believe the timing of Israel’s attack has been determined by upcoming elections. 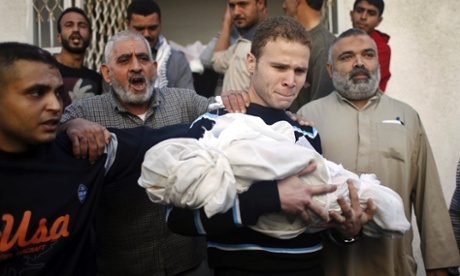 Netanyahu needs to look tough for his rabid public, so he brings more trauma and death to Gaza. It is grotequely easy for Zionists to act out their impulses on the Palestinians, just as they used to find south Lebanon easy. In this revolutionary age, is no Arab power going to make the slaughter more expensive? While pointless adventurism would be criminally stupid at this moment of general Arab crisis, the new leaders of revolutionary Egypt, Tunisia and Libya, and old leaders seeking to adapt to the revolutionary wave, should remember that national dignity as expressed through a pro-Arab and anti-imperialist foreign policy is one of the key demands of Arab revolutionaries. This is a test for the Egyptian Muslim Brotherhood in particular. The Palestinians must not be left alone indefinitely. Very, very well said. There is hypocrisy from some supporters of Palestine, who are unable to support the resistance in Syria. And there is hypocrisy from some Western think-tankers and journalists who back the Syrian revolution but are mysteriously absent today. The right to resist a brutal regime that is violating international laws is universal, not political.